If you’re familiar with me at all, you know that I have 5 cats. One (Alexa) is an indoor diva and the other four (Hannah, Bullet, Jelly Bean, and Queen Fatima) are outside cats. Alexa – who was “here first” as she likes to remind the others – will not even consider allowing the others to get so much as one paw through the door. Fortunately, these outside babies don’t seem to mind the arrangement. No doubt if they did show interest in coming in out of the weather, I’d have to have a long, hard talk with little Miss Alexa. We live outside the city limits, on a large piece of land. There is actually an old barn, as well as a garage (my husband keeps the door cracked for them to come and go, then cleans it out when spring hits…. sigh, I love him). When Bo and Svenn were alive, they absolutely loved the garage. They could be found sleeping up in the loft even in the summer! Bullet is also big on the garage and when the weather is particularly cold or stormy, off he goes. Jelly Bean likes to go back and forth between the garage and the barn. Odd that he’s the only one (of the many, many, many cats we’ve had over the years) to seek warmth and refuge in the barn. HOWEVER, my little outside girls (Hannah and Fatima) will not head for the garage unless it’s storming or snow is on the ground. No matter how cold it gets, they see no need to leave the carport. I always make them a little tent in the corner – with many thick covers and blankets draped over a few lawn chairs. When it isn’t too cold, all 4 cats can be found in their tent! Yet I always wanted something more – another warm option for them…. …something like a little house. Ironically enough, I had been thinking about this situation when I got an e-mail asking if I’d like a KatKabin to review for Cat-Pause.com. I was thrilled to accept and watched for its delivery daily. When the KatKabin arrived, Alexa and I anxiously opened the box. The KatKabin was bigger and even prettier than I had hoped for! They sent me a beautiful hot pink version and Alexa couldn’ t take her eyes off of it. I put it on the ground – without the little removable door on the front – to see if she’d go in. She’s kind of an odd duck about things like that, so I was skeptical. However, she marched right in, turned around and laid down on the soft little pad it comes with! Unfortunately for her, I had the KatKabin in mind for the outside kids – after all, she has a heated home with warm couches and warm beds! I hauled the beautiful little KatKabin outside for the fearless foursome to inspect. It was a chilly day but not cold enough to send the boys off to the barn or garage. Jelly Bean was the first one to try out the KatKabin. He actually took up residence for about an hour before the others got a shot at it! Bullet’s snide, mocking looks (imagine, a tough guy cat lounging in a hot pink cabin) didn’t faze him. He just went to sleep in his comfortable surroundings. The minute Jelly Bean left the KatKabin (nature called), Queen Fatima (a very small, adorable, fragile gray cat – she’s the spitting image of her feral cat mom, Ming Li) went in. Since we lost Ming Li (I loved that little eccentric cat! ), Queen Fatima looks at Hannah as her mother – something that Hannah endures with great humor. The fact that she separated from Hannah long enough to try out the KatKabin kind of caught us all off guard. Even on the coldest days, when I stick my hand into the KatKabin, I’m amazed at how much warmer it is in there. The cat’s body heat sort of creates a little sauna. When the weather isn’t overly cold (we’ve actually enjoyed some really nice weather for over a week), I take off the little removable clear door. My cats love to sit in their KatKabin and watch birds, one another, me….. Bullet actually tends to lie in it toward the front with his little arms sort of sticking out – it reminds me of a dog in a dog house. A comparison he doesn’t appreciate. KKZBL Doors: Single Door (as shown) The KatKabin DezRez is the new outdoor stylish house for cats. It is a light yet sturdy house with unique, feline-shaped ends that will appeal to cats of every type. The KatKabin will stand securely on any type of ground and comes with a KatKushion and a KatFlap door to keep wind and rain out. Please Note: Double-door KatKabins are special orders, and thus NOT returnable. Please allow an extra 24 – 48 hours for processing on double-door orders. Features: -Royal blue is the ideal choice for that cool, confident cat about town. -Includes KatKushion and a KatFlap door to keep the rain out. -Optional double door setup has door on each end (special order, not returnable). -Outdoor stylish house for cats. -Light yet sturdy with unique feline-shaped ends. -Great shelter for abandoned, wild or feral cats. 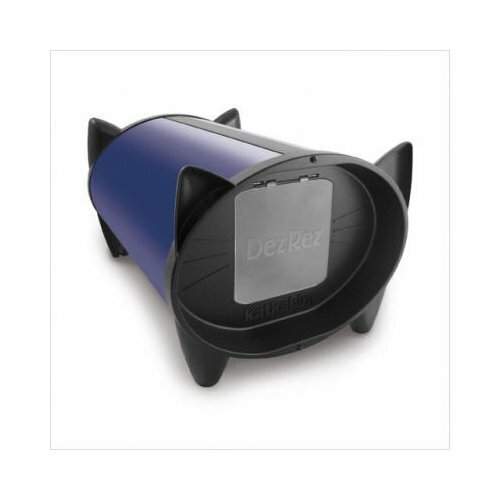 -Specifically developed as an outside cat house which withstand extremes of temperature. -Made from the strongest materials and will not fade in sunlight. -Will stand securely on any type of ground and comes with a KatKushion and a KatFlap door to keep wind and rain out. -Dimensions: 13” H x 16” W x 22” D.
Whether your cat is an inside cat, an outside cat, or enjoys the best of both worlds – he or she will LOVE this KatKabin. You’ll love how beautiful it looks and love the fact that it keeps your baby warmer even more. Read more about the KatKabin by clicking the link or order your’s today on Amazon. Order the Blue KatKabin . 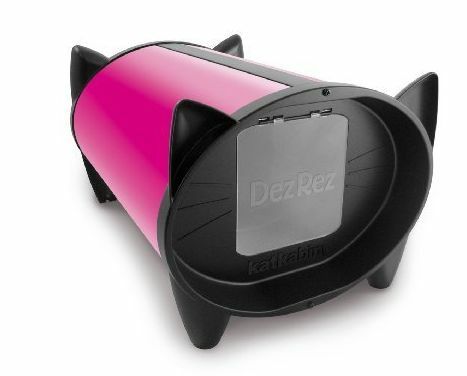 Order the KatKabin DezRez Standard in Hot Pink . Remember, the KatKabin is available in many colors. Just click through one of the links above and find the color you want! Those of us who love our cats like family (which is exactly what they are) do everything in our power to make them healthy, safe, and happy. This is just another way to show our babies how much we love them.